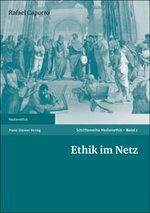 Ethik im Netz. Stuttgart: Franz Steiner Verlag. Schriftenreihe Medienethik, Bd. 2 (2003), 278 S.
- Die Welt – ein Traum? Rezension/Book Review: Adrian Holderegger, Freiburger Zt. f. Philosophie und Theologie, 50. Band (2003) 3, 596-600. Copyright © 2013 by Rafael Capurro, all rights reserved. This text may be used and shared in accordance with the fair-use provisions of U.S. and international copyright law, and it may be archived and redistributed in electronic form, provided that the author is notified and no fee is charged for access. Archiving, redistribution, or republication of this text on other terms, in any medium, requires the consent of the author.